Geez, another one that was hard to watch. You would think Yanks’ RISP drought would end probably today, but… not today. The Yankees have dropped six of their last seven games. Nathan Eovaldi had a decent outing clouded by one bad inning and that definitely wasn’t enough for the Yanks to win with their struggling offense. Turns out that the Yankees did score with no one on base though. In the second, Did Gregorius drilled a 1-1 fastball into the right field seats for a 1-0 lead. A lead! Unfortunately, that would be all the run that they’d score off Kendall Graveman. All in all, this was the best start of Nate’s 2016 season so far. Quality start is a dumb term but Eovaldi threw well enough to warrant a win, pitching six innings of three-run ball while striking out seven. Eovaldi got into a trouble in top of fourth. He allowed back-to-back doubles to Billy Burn and Chris Coghlan to allow a run. The next batter, Josh Reddick, hit a squib single to left that drove in Coghlan. It looked like Aaron Hicks’ strong arm was going to get him out easily at home but Brian McCann couldn’t handle the tough bounce in front of him. 2-1 A’s. Things got worse when Danny Valencia singled to center to make it runners on corners with no out. Stephen Vogt’s sac fly made it 3-1. It seemed like the Yankees could have gotten out of the inning when Jed Lowrie hit a grounder right at Chase Headley for a potential DP. Headley bobbled the ball for a second, which erased the DP chances but it seemed like he would at least get the force out to 2nd by flipping the ball to Didi. Gregorius, however, dropped the ball to have both runners safe. Khris Davis followed it up with a sharp single that ricocheted off of the 3rd base bag to load the bases. Lucky that ball didn’t roll past the base – could have been an easy double. The Yankee defense finally stepped up when Hicks caught Alonso’s fly ball and threw Valencia out on the plate for an inning-ending double play. It was a heck of a throw, registering at 105.5 mph per StatCast (fastest ever recorded), according to Bryan Hoch. Hicks was also a hard-throwing pitcher as a high school prospect so he has a gun. This was a wacky inning that could have gone either better or worse. After tonight’s start, Eovaldi has 22 K’s and only 3 walks in 17.2 IP, which are just about the prettiest numbers in his season stats. Some of the others are – 6.11 ERA, 2.04 HR/9, 21 hits and 4 HR’s in 17.2 – are not as pretty. His .362 BABIP allowed indicates that he’s been unlucky with some batted balls in play. Then again, it also could mean he’s been allowing meatballs in occasion that hitters devour instantly. BABIP will normalize and Eovaldi’s ERA will fall below 6 soon (I think). I think the fact that he’s struck hitters out to a 11.57 K/9 rate is pretty nice (6.57 K/9 in career). With one out in the seventh, the A’s took out Graveman for lefty Marc Rzepczynski. 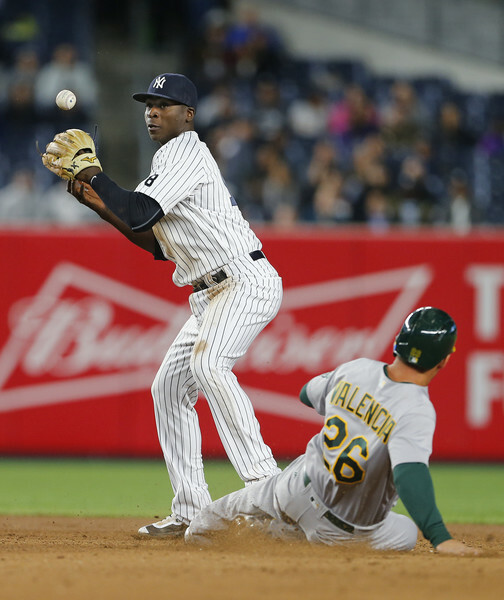 Didi lined a single to center and CF Billy Burns mishandled it to advance Gregorius to second and Headley to third. The Yankees had two runners in scoring position with one out. What could possibly go wrong? Hicks hit a grounder to SS Marcus Semien. Gregorius made an ill-advised decision to advance to third from second and Semien (at least initially seemed to) tagged him. He also finished a throw to first to get Hicks out, completing a double play. However, the Yankees challenged the call, stating that Gregorius was not tagged. YES Network’s replay seemed to show that Gregorius eluded Semien’s tag but did he get out of the baseline? Possible. Either way, the umpires stood by the initial calls to end the inning. It was that kind of night. Branden Pinder took the mound in the eighth to keep it a two-run game, which he exactly failed to do. He allowed back-to-back singles to Billy Butler and Vogt, and walked Lowrie to load the bases pretty quick. Khris Davis hit a 0-1 fastball up the middle to drive two in, 5-1 A’s. Pinder did induce a GIDP and strikeout to limit the damage to two runs, but a four-run deficit seemed quite insurmountable with the reeling Yankee bats. In the bottom of eighth, the Yankees scored another non-RISP run. 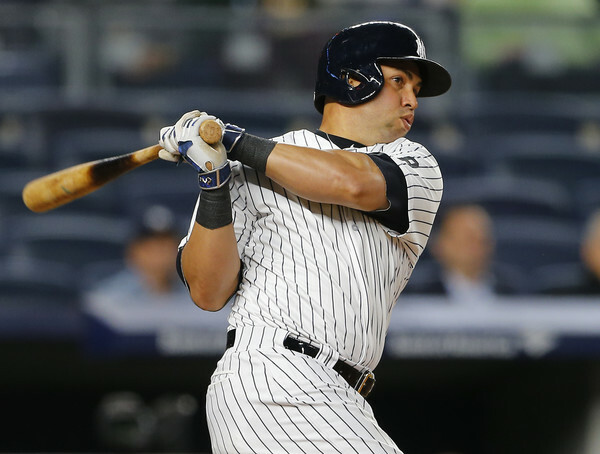 Beltran hit a big solo homer to the second deck to make it 5-2, continuing his hot April. Geez, remember when he was godawful in last year’s April? (.162/.216/.265 in 68 April AB’s) Completely different this time. After tonight, his line is at .327/.333/.633, good for a 174 wRC+. The A’s sent their closer Sean Doolittle for the bottom of ninth. McCann beat the shift to maybe start something, but A-Rod and Headley both flew out in two pitches, which was, well, anticlimactic. Gregorius struck out in three pitches to give a fitting end to recent offense tone. 5-2 A’s win. So this is not really a Yankees thing but in the top fifth, Kendall Graveman became the first pitcher to bat in the current Yankee Stadium, thanks to the A’s having to sub Valencia out and move Lowrie off DH to the second base. It was also his first ever ML plate appearance. He’s never had a minor league at-bat either. He struck out in three pitches (predictably so) but it was a moment, to say the least. Ivan Nova came into the game in the ninth and… actually pitched well. He threw a 1-2-3 inning – two ground outs and a fly out. Tonight’s outing improved his season ERA to, well, 6.00. Kirby Yates also came into the game today, throwing a scoreless inning in the seventh. For a guy who made one of the last roster spots out of ST, he’s been decent: 4.15 ERA in 4.1 IP with 2 walks and 6 K’s. If you dare to look back to this game, here’s the box score, updated standings, video highlights and WPA. The Yankees will attempt to not get swept by the A’s in the home tomorrow. Luis Severino will take the mound against Rich Hill on another 7 pm game. Sleep well, folks .